I have no idea what to make of this book or how to sum up how I feel about it in a snappy sentence. I certainly like it enough to read the sequel, though. Honestly, I kept feeling like nothing much exciting was happening until the last third. I felt like the worldbuilding was also a bit lacking, and there wasn't anything particularly intriguing or fascinating about this world. Oooooh, ~the mystery of the Shadow Fold~. I felt like that was the only thing remotely interesting about this world, and even that wasn't all that mysterious and strange after a while. I know Ravka is Russian-inspired, but apart from all the Russian words that kept popping up all over the place and the Russian place names, I wasn't sure I got a sense of the culture of Ravka at all. I feel like Bardugo relied too much on using the Russian words and not enough on imbuing her whole story with the culture of the place. And I had no sense of what the world outside of Ravka was like. Fjerda and Shu Han were mentioned a lot but I didn't know what these places were like apart from a quick paragraph that summed up what their people's attitude towards Grisha were. ... they did not see the girl reach out to clasp the boy's hand or the look that passed between them. The Duke would have recognised that look. He had spent long years on the ravaged northern borders, where the villages were constntly under siege and the peasants fought their battles with little aid from the King or anyone else. He had seen a woman, barefoot and unflinching in her doorway, face down a row of bayonets. He knew the look of a man defending his home with nothing but a rock in his hand. But then Alina and Mal grow into teenagers, and... Alina's in love with Mal, but Mal has no idea. All the other girls are into Mal too, and he's also into a lot of other girls. But Alina? He doesn't really seem to care much about Alina anymore. Alina and Mal are in the army together. They're not Grisha. Grisha are people with magical abilities; the people of Ravka seem to be tested when they're children for these abilities, so that those discovered to be Grisha can be taken away and trained. 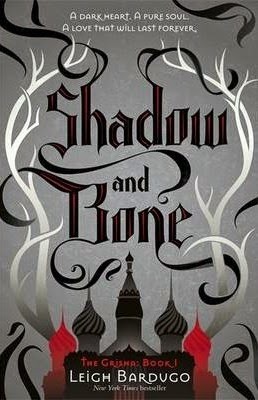 But oh wait... when Alina and Mal cross the Shadow Fold, some terrible things happen and it turns out Alina might be Grisha after all. She has a unique ability that might just be able to destroy the Shadow Fold and save Ravka. So she gets whisked away to Os Alta by the Darkling, the leader of the Grisha, who tells her the story behind the Shadow Fold, and she starts her training in Os Alta. What also annoyed me was how alllll the other girls in this story were portrayed apart from Alina, with the one exception of Genya. Alina basically has no female friends at first because, she tells us, all the girls who were so eager to befriend her initially turned out to only want to be her friends to get closer to Mal. Then, once Alina gets to the palace at Os Alta and meets all these Grisha girls, they were all portrayed as super annoying and bitchy and shallow as well. It was like a typical high school story. It's just the sort of stuff I am so bored of seeing in books. I didn't want to see it in a fantasy book too. There was, thank God, ONE young female character, Genya, whom Alina liked enough to become friends with. It sort of redeemed the story for me that this female character was basically really into make-up. That's kind of her specialty. To make people look more beautiful. It was nice that the one female character that Alina becomes real friends with was the one who had the sort of ability that might normally seen as a trait of superficial girls who care about nothing but their appearance. But there was a lot of interesting stuff going on under the surface with Genya which I loved, and I want to see more of that! I hope to God Alina makes more female friends in the next book or I will throw stuff. I liked Alina's character arc. I wasn't overly impressed by her at first, but her arc was fascinating and empowering in unexpected ways, and that was where the book kept on surprising me, to my delight. Though sometimes I wasn't sure whether the book was undermining itself again in that area, ultimately, I really liked that the book was about Alina trying to discover who she was on her own, her power and her potential. Defining herself as an individual. Not as the girl who grew up with Mal and is in love with him. Not as the girl who wants the Darkling's attention, who wants to prove herself to him. But just as Alina, strong and whole for the first time in her life even without the boy she's in love with by her side. And it was awesome, the direction that this book took at the very end. I LOVED IT. I was so thrilled. I think if the ending is any indication of what the second book will be like, then there's a good chance I will love the second book more than I did this book. Because yeah, the book took a while to get to what I wanted it to be, what I wanted Alina to be. But it got there in the end. Now let's just hope this is something that will carry on through the rest of the trilogy, and we'll be all set! If you choose not to participate in it, please leave a comment on my page or here saying so. Nice review! I really liked the book personally, and I'm also going to read the sequel....someday....when I get to it. I like this book, but I feel the same way as you that it's not a favorite of mine. I think I rated it a 3.5 stars as well. 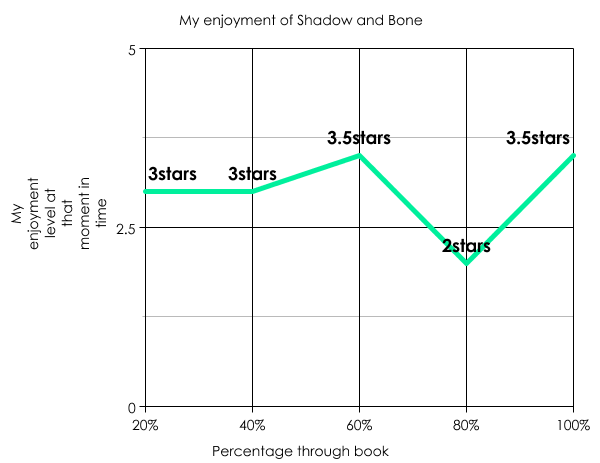 But I LOVED the second book. I'm really really excited for Ruin and Rising! Mmm. I sympathise with Genya and her decisions though, but I do wish things could have gone otherwise. There's not much of her in the second book either, but they do introduce another female character who has some depth to her. I still wish the book was better with female characters though. Blegh.